Yes, some uninstalls require a re-boot. I need to see the log for MBAR when you able to get it to me. It said I had no malware and did not offer a cleanup button! so I ended and here are the reports. How's the computer now? Any other issues? I didn't remove any of the ESET scan downloads....and have closed out those screens.......? How's the computer now? Any other issues?" 1. Are you saying my computer is clear...no problems? 3. Previously, I had a house button on the task bar and it was sort of like a START button....had put off exploring it but now it's not there.....was it removed somewhere along all of this?? 4. The regular icon for Mozilla/Firefox appears as a sheet with a turned down corner....how do I get back the regular fox in a circle icon back??? 5. what do I do with all these programs that were installed??? 4 have MS blue & yellow shields on them...does that mean they have been OKed??? 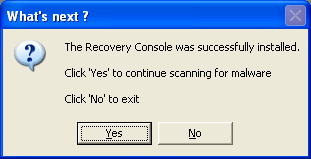 Did you still want me to run Security Check by screen317? I'm not sure about that button. I've never seen it before. Is it something you installed yourself? Your best bet would be to uninstall and re-install Firefox. You may keep AdwCleaner and MBAM and run them on a regular basis, if you have room for them. I just wanted to see what you have for protection but this next scanner will tell me. "To prevent your anti-virus application interfering with ComboFix we need to disable it. See here for a tutorial regarding how to do so if you are unsure." I am unsure and the "here" link comes up with an "error|PC Help Forum" (and I'm logged in). need new link, please. Sorry, To prevent your anti-virus application interfering with ComboFix we need to disable it. See here for a tutorial regarding how to do so if you are unsure. 1. Thank's for the new link, however, McAfee LiveSafe-Internet Security (the 30 day trial included with this new computer) is not listed. I tried the other McAfee options to see if they led me to possibly disabling it. Will turning off the Real-Time scanning be ENOUGH? or do I need to turn something else off as well? like the firewall? I checked to see if the Windows firewall was on but it said that it was under the control of McAfee (which expires in 11 days but I would like to delete the whole thing and install Panda in the next 5 days). 2. Do I need to also disable Malwarebytes, which opened upon bootup, for the first time today, and said that I was updated and protected! And what about all that other stuff that was put on my computer: Anti Hacker, AFT Cleaner, Webshield, Computer Performance, Event C, & CCleaner???? Do any of these need to be disabled? (I have not even opened them and don’t know if they are actively running). “ComboFix is not meant to run in ‘Compatibility Mode’. The program shall now exit”. FYI, I am now back home and hope to respond more quickly....thanks for your patience and guidance. so I assume they have the latest version. I believe that I chose the BC link that you offered to download from. It appears that combofix is still not compatible with 8.1....Do you want me to uninstall it, make sure it is downloaded from BC and try again? what do you want me to do next?